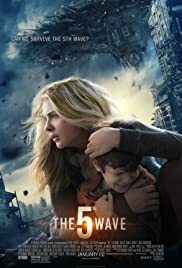 "The 5th Wave" is the umpteenth version of a post-apocalyptic scenario that has all but taken over pop-culture since the turn-of-the-century (or, more specifically, the attacks on 9/11). In this case, it's a race of mysterious aliens who, in an effort to take over the planet, are eliminating humans one "wave" at a time (destroying the power grid, creating massive earthquakes and tsunamis, spreading fatal epidemics, etc.). The screenplay focuses primarily on one Ohio family, and, specifically, their teenage daughter, Cassie (Chloe Grace Moretz), who suddenly has to find ways of surviving in this new and dangerous world where everyone is out for him- or herself and, thus, no one can be trusted. As they pass through desolate, auto-strewn landscapes that look like they came straight out of "The Walking Dead," Cassie and a caring (and dreamy) stranger (Alex Roe) - who saves her life at one point and rehabilitates her to full health - go in search of her missing little brother. And, speaking of TWD, since the movie can't fit any ACTUAL zombies into its narrative, it partially compensates by at least having a character NAMED "Zombie" (Nick Robinsons). Ah well, after a few moments of fleeting interest in the early stages, the movie quickly settles into a predictable and boring series of teen drama, alien invasion and end-of-the-world tropes. And with its open-ended conclusion, we're left wondering (or is it dreading?) if there will be a 6th wave in our movie-going future.